If you look closely at the photo below, you’ll see a mass of millepedes on the trunk of this damaged tree. At first glance, it may appear that these critters have caused the damage to the tree. But, first glances can be deceiving! Trees decline or are damaged for a variety of reasons…improper watering or pruning, drought, lack of fertilizer, physical damage from storms and critters. Drought stressed and under nourished trees are attractive to a host of pests and diseases. When plants go into decline, they can send out pheromone signals that attract pests to move in and feed on the plant. It’s nature’s way of culling the weak in order to keep the larger population healthy. In the image above, a client’s Bradford Pear had suffered serious damage which then attracted a cluster of millipedes. While at first glance it would seem that the millipedes were the cause of the problem, they in fact were only there to consume the decay that had already set in on the tree due to previous damage. Using a pesticide at this point to kill the millipedes would do nothing to solve the real problem for the tree. At some point in the trees life, there appears to have been a wound that was not healed properly and allowed moisture, disease and pests to enter the trunk. If diagnosed and treated earlier, the large branch and tree could have been saved. 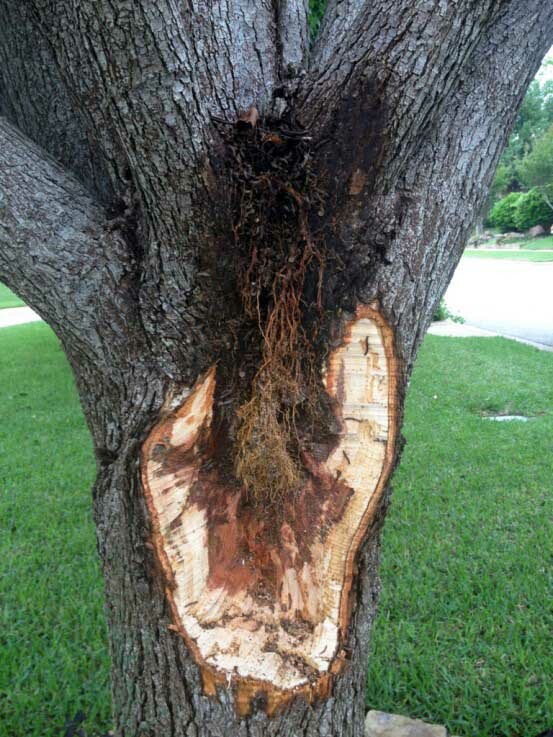 While we are not a tree care company, we often find ourselves called upon to check out problems you have with trees or other landscape plants. We encourage everyone to call a certified tree care company to do an annual check-up on your trees. Keeping your trees healthy and vigorous through proper feeding is an important part of landscape maintenance. Prevention is always the best medicine. If problems can be caught early they can often be treated. When you are part of our organic Soil Building Program, you can be sure your soil will be healthy enough to support healthy lawns, garden plants and trees. For more information about how our popular program can improve your lawn and garden, you can request a quote online.